It was Round 19 and the Panthers got off to a quick start against Sturt, kicking the first five goals of the game and going on to a 49 point victory, vaulting themselves into second position on the ladder. It was a sunny day at Hickinbotham Oval and with Tom Fields celebrating his 50th the boys in 'Blue and White' took it to the Double Blues and never gave them a shot at it. Sturt were unable to match the speed and intensity of the Panthers who controlled possession (+92 in disposals) and led the way at every major break. The win somewhat avenging the 48 point loss the Panthers suffered at Unley in Round Eight earlier in the season. South showed their offensive prowess, with 10 players hitting the scoreboard and kicking an impressively accurate 16.6, while also working hard in defence to keep Sturt to just seven goals for the day spread between only two goalkickers. Tom Fields celebrated his 50th game for South in style, sneaking his way onto the goalkickers list with one of his 22 kicks (21 of which were effective) and also adding 12 marks, 3 inside 50 and 4 rebound 50s in a best on ground display that also earned him Advertiser SANFL Player of the Week honors. The Panthers won the all-important midfield battle thanks to the hard work of Brede Seccull (25 disposals and 4 clearances) and Joel Cross (25 disposals, 7 tackles and 5 clearances), who were instrumental in the middle for the Panthers. Adam Gulden provided the South forwards good opportunity with seven inside 50s, while Tyson Brown continued to grow in confidence at League level through another strong performance with 23 touches and seven marks. South Adelaide completed a 10-0 sweep of their 2016 home games with a rousing 38-point victory over Adelaide in Round 22, but it came at a cost. Versatile tall Ben Haren injured his AC joint in a marking contest against the Crows and will take no further part in season 2016. Ben joins Tarak Redigolo (knee), Jake Veide (knee) and Peter Rolfe (knee) on the long term injury list. Meanwhile, classy defender/wingman Adam Gulden also suffered an ankle injury against Adelaide, but has been listed as a test for the Qualifying Final and there is hope around the club that he will recover in time to face the Double Blues. Meanwhile, Sturt have been bolstered by the return of several League players in recent weeks. Fraser Evans, Ben Hansen and Brodie Martin have all returned to the field after being absent in Round 19 at Hickinbotham Oval. Likewise, clearance machine Aidan Riley has also been on the sidelines for some time. Listed as 1-2 weeks away with a broken arm, as is man mountain Jack Osborn with a quad injury. However, SANFL's Zac Milbank reports that the Blues pair will be put through their paces at training this week and are a chance to front up this weekend. Keep an eye on the website on Thursday evening this week for the full Finals Week One teams. 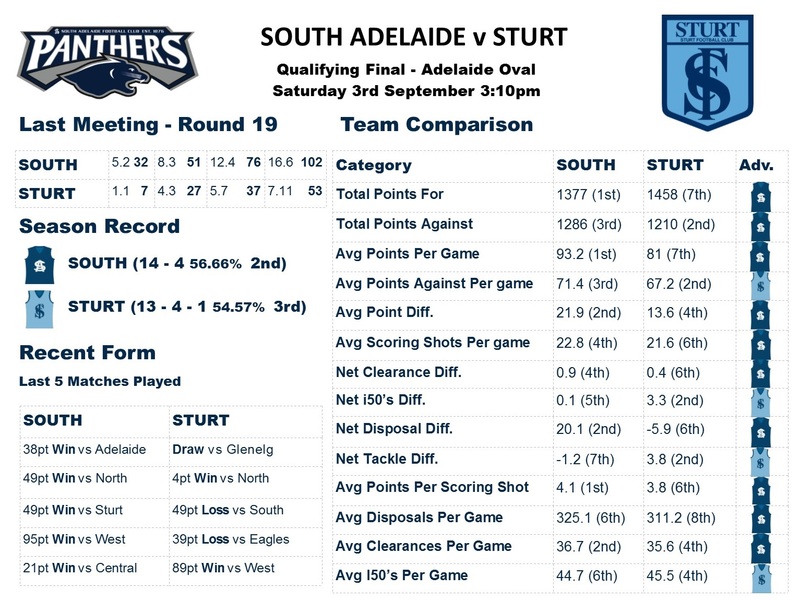 Offence meets Defence: South Adelaide are the most prolific scoring team in the competition, while Sturt have built their season on a miserly defence. 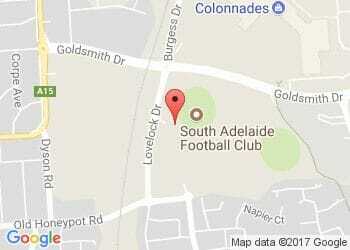 South Adelaide enter the Finals full of confidence and form, having won their last five games, including victories over fellow September participants Central District, Sturt and Adelaide. Sturt finished the minor rounds in less spectacular fashion. After thumping wooden spooners West, the Double Blues lost to each team ranked ahead of them on the ladder before hanging on for a four-point win against North Adelaide and drawing with Glenelg in their final match. However, Sturt cannot be underestimated. In Round Eight, the Double Blues put an end to the Panthers six-game winning streak in emphatic fashion. Sturt brought a sound game plan and hunger for the ball to the contest and outplayed the previously undefeated Panthers in most aspects of the game, winning the match by 48 points, controlling the possession count 329 to 271 and dominating inside 50s 63 to 29. Both sides are ranked top tier for clearances, with the battle between Magarey Medallists Joel Cross (23.3 touches a game) and Zane Kirkwood (24), clearances machines Brede Seccull (23.3) and potentially Riley (23.6) and slick ball users Nick Liddle (19.7) and Brodie Martin (19.6) sure to be an entertaining one. Meanwhile, the match up between Ken Farmer Medallist Brett Eddy and SANFL State Team defender Fraser Evans will also be an intriguing one to watch, as will it be interesting to see who goes to Sturt's own prolific forwards Kory Beard and Mark Evans. Overall, it will be an exciting contest between two sides that have enjoyed a successful 2016 campaign so far. Make sure you get out to Adelaide Oval this Saturday to catch all of the action from 3.10pm!